The secret to installing hardwood floors. Let's take a look at a job that was just recently completed. 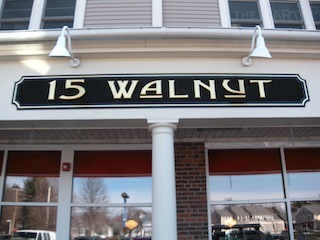 15 Walnut was a commercial job, that consisted of 1200 sq. 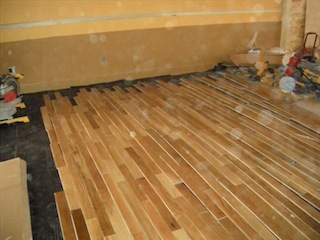 ft. of subfloor installation, new hardwood floor installed and tied into existing, and repairing existing hardwood floors. This project was completed in 5 - 9 hr days by one person. Aside from just the hardwood floor installation. I had to deal with other contractors working simultaneously. Work was done in sections at a time, you're not able to move ahead until, others got out of the way. It involved a lot of moving and cleaning and constant traffic. When installing hardwood floors in busy traffic areas, it's easier to move with the flow of traffic, rather than against it. 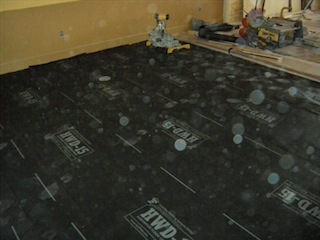 When moving and cleaning was unable to be performed, the subfloor installation was being done. 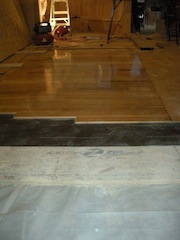 When no more subfloor can be installed, the next thing to do was working on installing hardwood floors. Once, a section was completed, you would move onto the next area. This would continue throughout the rest of the job. Of, course the job can be done with more workers in less time. That option is not available, there are carpenters, plasterers, electricians and other tradesmen working similtaneously. You're only able to move when they move. As big as the space was, it was a tight place to work in. The secret to installing hardwood floors, you ask? When your dealing with a deadline. Whether it's a move in/out date, grand opening or re-grand opening. It requires you to be patient and work at the same pace as everyone else. There is no point in working faster, than everyone else. If, that person's work is not complete, they're not going to move. Plan your work around them. 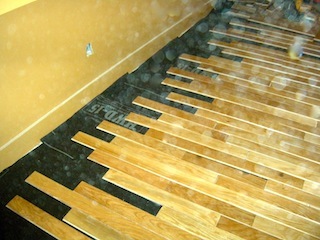 repair, or installing hardwood floors = Consistency. Work was not being done in a super fast pace, rather a consistent pace. Kind of like the way of the tortoise. Of course experience and technique helps. Whether you have no experience or 50 years of experience. If, you don't plan or are not consistent - especially consistent. It can take you a very long time to complete a job. You'll either be standing around waiting or just wasting time running around. Sometimes we can lose track of things, we just need to walk away, take a breather, then come back and continue. Bottom line, have a game plan on how you will deal with your surrounding and be consistent with what you do. The image to our right with the vapor barrier is day 4 of the project. The final 12 bundles of installing hardwood floors. Not everyone will be working in a commercial property, but more likely a residential property. Here's a Tip on how to stay consistent. Some installer may either set-up and install 1 piece or 1 row at a time. Instead, before you start banging the floors in place, set-up your entire room, don't be picky. Find a home for every piece. You'll be able to cut down on your stops and move pieces around to gain a specific look. Once you get into the rythym of installing hardwood floors. Install every piece in, staggering down as many row as possible. It may be 5 rows, it may be 15 rows. Just keep stapling, until you can't install anymore pieces before you start your cuts. Another way to reduce down time and increase consistency is on your cuts. When, your cutting in the end pieces. Cut from 3 to 5 pieces at a time, reduce the travel time to the miter saw. Alter the number of cuts to avoid a repeat pattern on the end pieces. Switch out pieces and make adjustment if necessary. Make every cut count, this will reduce waste, time and help get the job done quicker. The secret to installing hardwood floors, planning and consistency. Experience won't do you any good, if, you're making mistakes and having to redo things. Take your time, plan things out, and be consistent with what you do. You'll have the job done before you know it. Using the method that we've shown here, a single installer can average 60 sq. ft. in an hour. If, you would like to see more images on 15 Walnut visit our commercial gallery. Learn other ways on installing hardwood floors, from our other installation pages. G and S woodfloors Lynn,Ma.